"On a flat marsh, at the edge of a great green lake, surrounded on all sides by high and gloomy mountains, lies the City of Dreadful Hate, says Mr Jan Gordon in "The New Witness." It has no country, for those who hold it are not its owners, and to those who are its countrymen it will not submit. The greatest city in all those regions, yet has it no sovereign power, for hat constructs nothing ; and so hating itself it lies supine, a prey to any who will possess it. Within its walls a great street divides hate from hate, and at night he who does not hate must carry a lantern, so that the haters shall not kill him. This is not romance ; this is a description of Scutari, and in Albania. A truly strange city, with its mosques on one side of the "rue Internationale" and its cathedrals on the other - muezzin crying against Matins chimes - and its overlord the Montenegrin who will have none of either religion. Scutari casts longing desires back to the days of the International occupation when English, French, Italian, Russian, Austrian and German officers and soldiery flaunted in its cafes and spent lavish money in its bazaar. That was in August, 1914, and in a fortnight every soldier was gone." The international occupation was a peace-keeping force of about 2,000 French, German, Austrian, Italian and English troops, with a British officer, Colonel George Fraser Phillips, in command. The rapid evacuation took place on the outbreak of WW1. "Jo and Mr. Suma in the Scutari Bazaar." "The Luck of Thirteen" (1916). Jan and Cora gordon provide an account of the Serbian retreat in their book "The Luck of Thirteen" (1916). 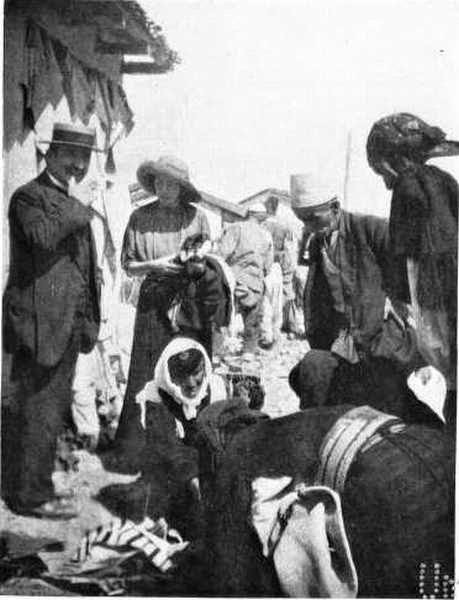 They returned to the area in 1925 and published the story in the book "Two Vagabonds in Albania" (1927).